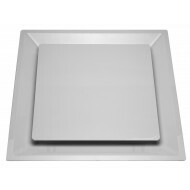 This Ceiling Diffuser is Made in the USA of high density plastic that won't dent, rust, fade or chip. You get the vent cover and the register boot which is plenum rated. The diffusers are 12" diameter and available low profile Round or Square models or our one of a kind Capital Crown Molding style.They are available in Ceiling White and also a variety of Custom Graphic versions.